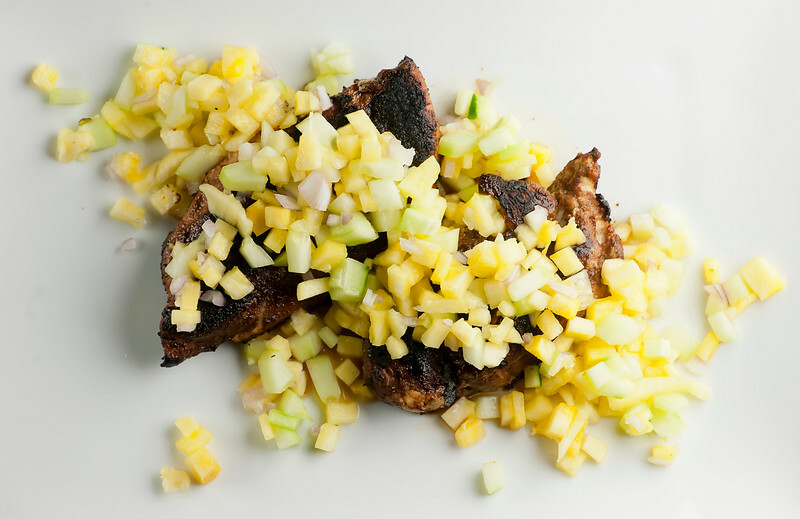 I am currently in a love affair with my cast iron skillet, which is one of several reasons why this recipe for blackened chicken with pineapple salsa is in heavy rotation in my kitchen these days. First of all, I love the crispy, slightly charred taste of the chicken, which is flavored up with a mixture of sugar, spices and everything nice before it hits the piping hot skillet. And second, I love the heap of sweet pineapple salsa that you cover it with once it hits the place. Spicy, sweet and summery – this is definitely a winner, winner chicken dinner. Let’s make it! One of the keys to making this chicken sing with deliciousness is the rub that goes on it before you cook it. Sugar, ground ginger, garlic powder, cayenne pepper and allspice – mix it together and pat it on GENEROUSLY. Rub it in but good. It’s going to give your chicken a sweet and sassy crust that is Out Of This World. And the other key of course is the salsa. I highly recommend getting a fresh pineapple for this one (and click here for how to tackle a fresh pineapple – it is so easy! ), but if you need to, the canned kind will work just fine. Chop it into teeny cubes, along with some peeled cucumber and shallots, and toss it up with some lemon juice. So good. The chicken gets fried up in a little vegetable oil until each side is deep brown-black, about 4 minutes per side. If you have an instant read thermometer (which is the very best way to test doneness in my book) you want it to measure 160 degrees. At that point, all that is left to do is take it out of the pan, spoon a ridiculous amount of salsa on top and dig in. 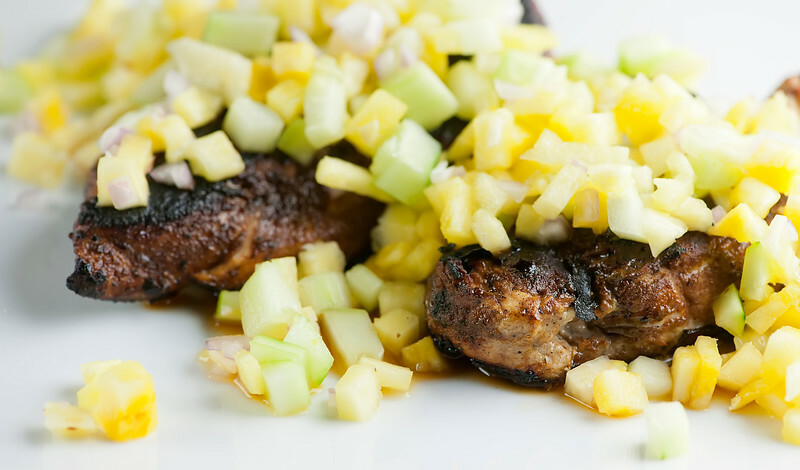 Mix together pineapple, cucumber, shallots and lime juice and set aside. Mix all spices together. Pat chicken dry with paper towels, and generously press spice mixture all over chicken pieces. Heat oil in a heavy skillet over medium high heat. Add chicken and cook until deep brown on each side, about 4 minutes per side or until an instant read thermometer registers 160. Put chicken on plate, cover with LOTS of salsa and serve. Yum! And yes to the magic of cast iron skillets! I’ve been collecting various sizes this past year and am in love with each of them. I especially like my monstrous 17″ pan that does wonders for roasting sweet potato chunks in the oven as well as turning out a delicious LARGE pizza. This is the perfect summer meal in my book Kate! Spicy with a little bit of sweetness! Love it! Isn’t sweet and spicy the best? Hope and Tucker are doing okay this weekend! love the caribbean flair to this dish, and what a great way to put a cast-iron skillet to use. the salsa is awesome too! Such a great recipe. I ended up doubling the spices for the chicken, as I ran out after pounding them to a 1/4 inch. The salsa is so good and the meal is so healthy and satisfying. I will use leftovers to make a cold chicken, rice, pineapple salad. Thanks, Kate! That salad sounds like perfection – I’ll be making some extra of this recipe next time around so that I can try it!